Until we settled down in a landed property in my secondary school days, my family has moved house a grand total of seven times, and always to a public housing flat. 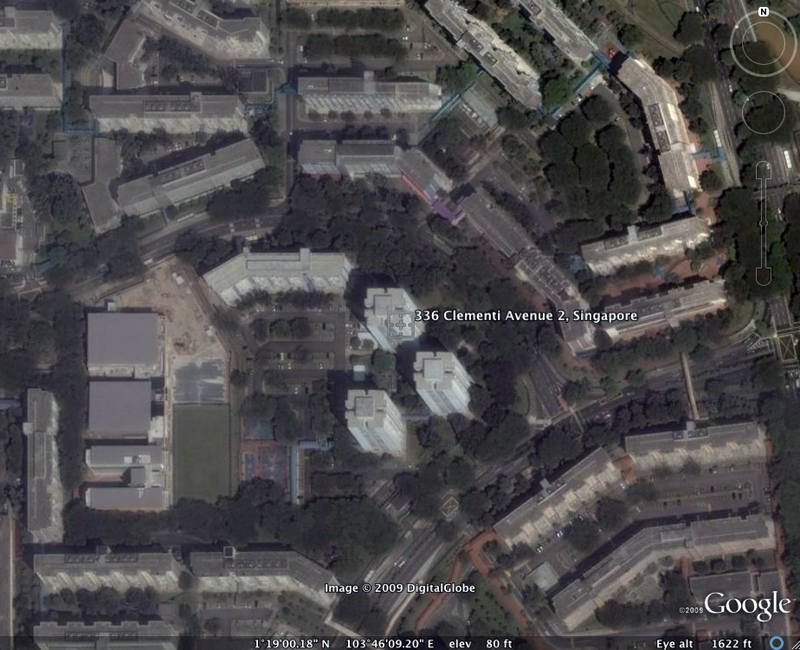 It was a priceless initiation into Singapore’s inimitable public housing architecture and landscape. I have no recollection of my first home, supposedly a Singapore Improvement Trust (SIT) flat in a low-income rental apartment block on the spot now occupied by Tiong Bahru Plaza. 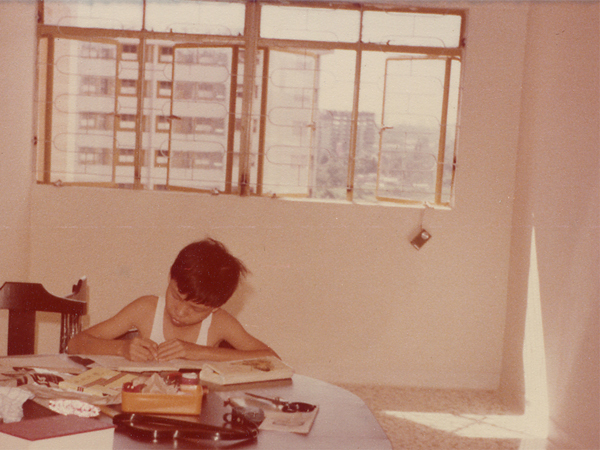 My earliest memory of ‘home’ was a two-room flat in a 1970s Housing and Development Board (HDB) slab block in Telok Blangah. It must have left a deep impression, for even after moving elsewhere, I was still haunted by a strange recurring dream – an ominous black dog running across an open field, as I watched from the seemingly endless common corridor. I have vivid childhood recollections of different home environments where relatives stayed, before these landscapes became history. I remember the Chinese New Year visits to my great-grandmother’s cubicle in a shophouse unit along Neil Road – a wiry thin old lady chatting loudly in Cantonese, her face half obscured by shadows in a space barely lit by a tungsten light bulb. I looked forward to excursions with an entourage of extended family into the deep wilderness of “San Pah”, or the countryside. A rickety ride through a winding dirt track flanked by tall lallang grass brought us to my grand-uncle’s timber plank and zinc roofed house, part of a sprawling fruit orchard and flower nursery somewhere in Lim Chu Kang. While my parents were waiting for their new flat to be completed, the family was always on the move, some times bunking in separately with different relatives, coming together only during weekends. 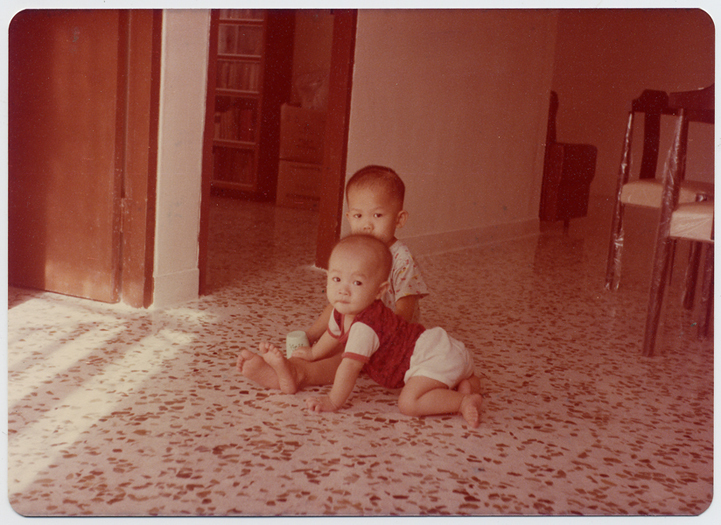 Finally when I was five, our family was united at last – in a newly completed HDB point block in Clementi New Town. I was tremendously excited by the prospect of moving into our first permanent home on a tenth-floor unit in Block 336, Clementi Avenue 2. Prior to the emergence of the HDB point block, the HDB, and its predecessor SIT, favoured the slab-block configuration in mass housing programmes. 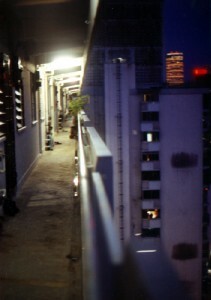 The imageable 14th storey Forfar House (‘Chap Si Lau’) at Queenstown comprised one or two-room units strung side-by-side by a common external corridor, stacked 14 storeys high, served by lift and stair cores. The slab block allowed for a high degree of standardisation, structural efficiency, and rapid construction. These useful attributes facilitated the newly elected PAP government to deliver their massive promise of 50,000 resettlement flats in HDB’s first Five-Year Plan, well-timed with the electoral term. Tower blocks, on the other hand, were traditionally reserved for white-collar civil servants, such as the 8-storey Windstedt Road flats built for City Council officers in the 1950s. The tower-block configuration re-emerged in the late 1960s in the 2nd HDB Five-Year plan. 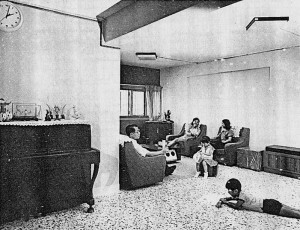 Due to construction costs, the point block design was deemed economically viable only for larger three to five-room units – affordable to families with at least lower-middle income. 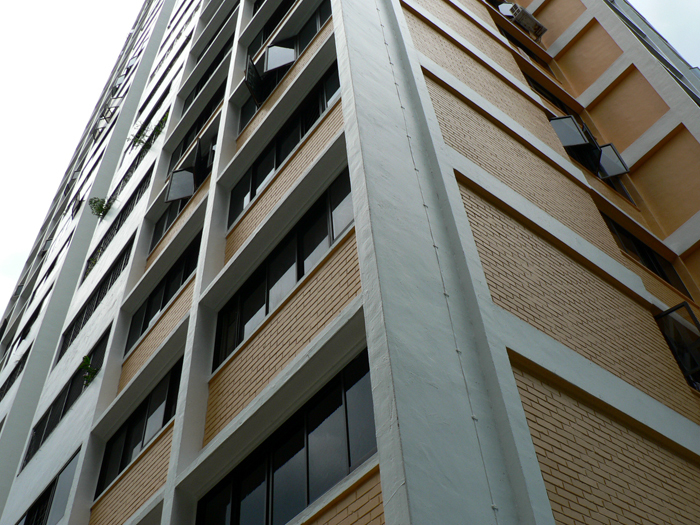 An early example is the unique “Y”-shaped 19-storey point block of 3-room units in Toa Payoh New Town completed in the late 1960s. From 1968 till 1971, the familiar point block type with four flats per floor emerged, with 4-room units for extended families served by a central core of two lifts and a staircase. At twenty-five storeys, much taller than the slab blocks, HDB town planners often grouped them in pairs or threes “as a landmark on the site”. 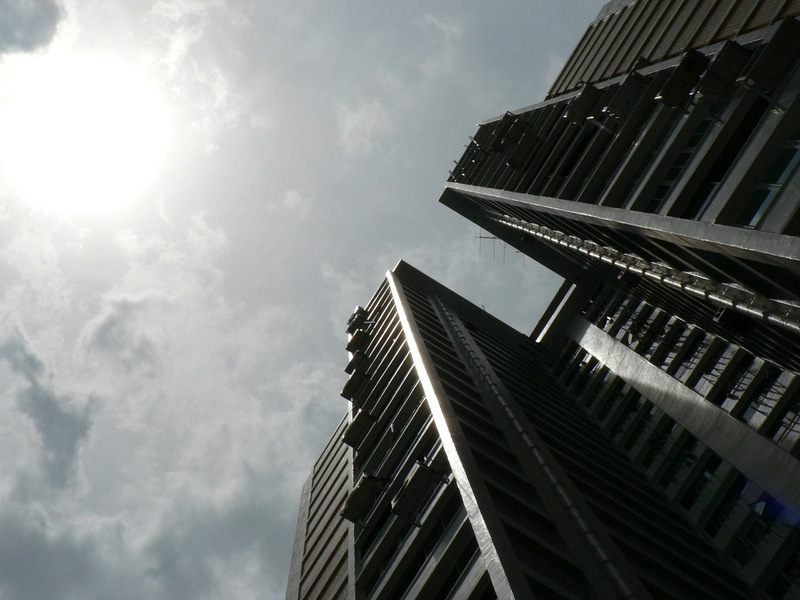 The most famous example of this pioneering type is the prominent towers in Toa Payoh Town Centre, which served as the Athlete’s Village for the 7th SEAP (Southeast Asian Peninsular) Games, held in Singapore for the first time in 1974. Five soaring point blocks were “strategically placed” as “outstanding landmarks” to terminate “interesting vistas” framed by two rows of four-storey shops and flats flanking a pedestrian mall. The dramatic contrast of scale and height was the architects’ attempt to “create visual identity” by varying the skyline of the town centre. The point blocks were intended as a progressive symbol of the HDB’s successful social housing programme, showcased before an international audience. The point block that my family moved into is the “5-room improved flat” modified after the 4-room typology. After 1971 the point block became exclusively used for the largest flat type (123 sq. metres). The exact same building type can be found in Ang Mo Kio and Bedok New Towns, which, together with Clementi New Town were constructed during HDB’s third Five-Year Plan (1971-75). My parents, baby-boomers employed in the Education Service with stable income and CPF savings, fitted snugly into the demographic profile of targeted buyers. Ten years after the launch of the HDB Home Ownership Scheme, purchasing a government flat had become a modern rite of passage for young Singaporean couples building their nuclear families. It was a life-long commitment to finance the largest family asset, a home, that would take decades of productive work life. Home Ownership could be seen as a huge driving force of industrialisation and productivity. The precinct where we stayed was rather unusual: it exuded an air of exclusivity with its premium of generous shared space. Three well-spaced point blocks overlook an open green with a children’s playground, shaded by rain trees and sea-apple trees, creating a sense of enclosure within the public space. Busy traffic is kept at bay through planning: the vehicular entrance to the precinct is off-set to the periphery, with the car park tucked at the rear of the site. The precinct enjoys quiet and tranquillity, particularly at night. On each floor, the four apartment units are separated by the dual lift core into pairs, with front entrances facing each other. A semi-enclosed lobby in place of common corridor provides a higher degree of privacy for residents, while providing ample space and opportunity for neighbourly interaction. Our immediate neighbour was a Hainanese family; we could scarcely understand her, but we got along very well with the kindly grandmother who offered us sweets and tidbits whenever we met in the lobby. The original lifts stopped only at the odd-number levels. Since we stayed on the 10th floor, we would alight on the 11th floor on the way up, but when going down we descended two flights of steps to take the lift from the 9th floor. The shared lift lobbies became a common space for interaction with neighbours from different levels – in fact a 9th floor neighbour became one of my close friends, enabled by an inconvenient lift. 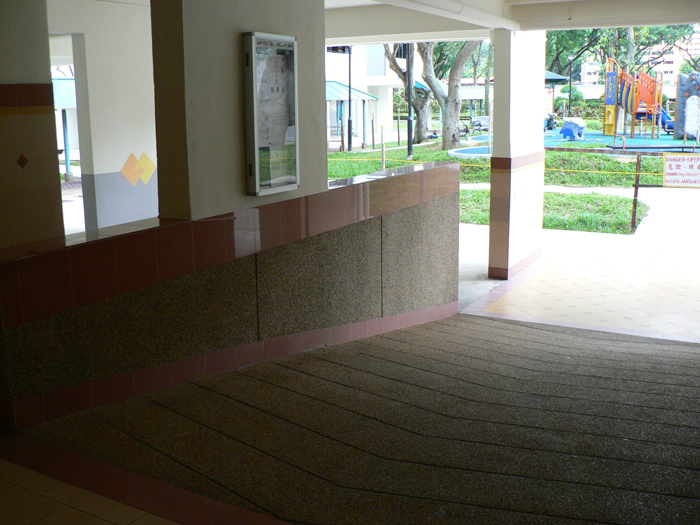 Due to the compact footprint of the point block, its void deck correspondingly became a more intimate space, unlike the intimidating rows of columns encountered in the slab-block. A terrazzo table served as a school bus waiting area in the wee morning hours for sleepy-headed students including myself, and colonised by chess-players in the afternoon. There was a mamak kiosk on one side of the lift lobby, where residents would pop by for their daily sundry or just a chat with the kindly Indian shopkeeper. It was also the faithful supplier of my “Figurine Panini” sticker and album collection that I scrimped and saved pocket money for. Now gone, the mamak kiosk was both a sentinel for the block and a social node. 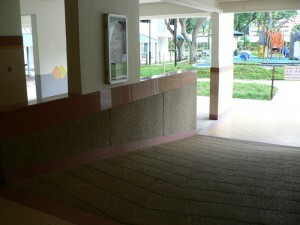 My ‘playground’ extended beyond the designated area right into the void deck. The lift lobby, raised by a metre to accommodate the lift pits, was accessed via a wide ramp – exciting topography for a kid learning to ride his BMX. 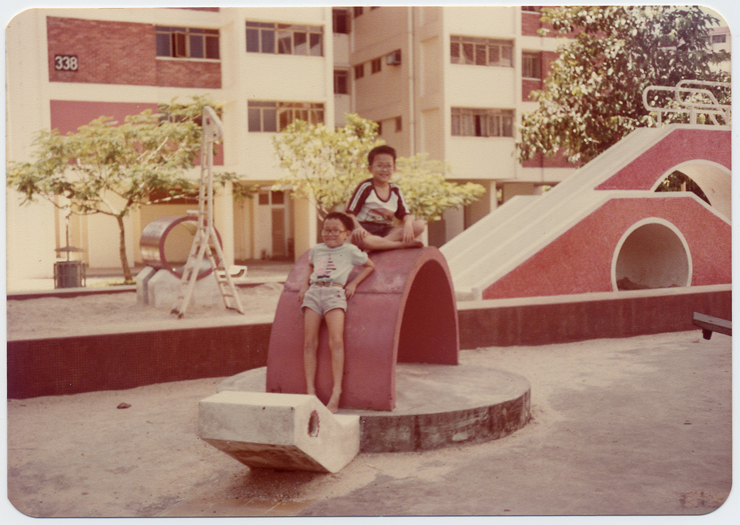 The playground was built at a time when HDB had an in-house design team for these shared amenities. There was a huge merry-go-round with the same chequered metal decking as early SBS buses, and two solid timber plank see-saws smoothened by use, weathered silver. Geometric abstractions of a giraffe and a turtle were assembled from concrete cylinders and welded steel hollow tubes. A mosaic-tiled terrazzo slide became a castle or spacecraft with some imagination. All fun and good, but nothing could beat the simple sand-pit, where everything could be made from nothing. Although our playground did not have the legendary ‘dragons’ of Ang Mo Kio and Toa Payoh, these equally economical and ingenious play-structures provided immense fun for hours on end. These early HDB playground were engaging, imaginative, and tactile, with a character and personality that could not be ordered off a glossy catalogue. Air-conditioning was still unaffordable to most families living in HDB flats, so the flat was designed for natural ventilation and daylighting. On windy days the flat would be cooled by breeze entering from the balcony and large fenestrations in the living, dining and bedrooms. The flat was spacious compared to my other HDB homes, and the interiors were filled with daylight from the generous windows. The great height afforded spectacular views and vantage points. I would tiptoe and peer over the balcony parapet wall – through the mild steel safety grille, of course – and try to spot which of my neighbourhood ‘kakis’ were playing downstairs. The novelty of height was particularly exciting to a primary school kid, an unlikely fascination being the rubbish chute in a corner of the long and narrow kitchen. The idea that something could just disappear forever down a dark, dank and smelly chasm right in your own home was both intriguing and repugnant. The chute also became an accomplice where food I disliked got discreetly chucked down, until I was caught red-handed one day. Then there is the darker side to high-rise living. People would brazenly dispose of bulky items directly from their apartment windows, including cabinets and television sets – ‘Killer Litter’ posed a real threat. High-rise flats were, and are still associated with suicide. One evening while doing my homework, I heard a sudden loud ‘thud’ – rushing over to the balcony I was confronted with a traumatic sight: on the concrete apron of the opposite block, a woman in pink pyjamas lay face-down in a rapidly spreading dark pool. The police arrived and covered the body in a black sheet; the incident was reported in the newspapers the next day. 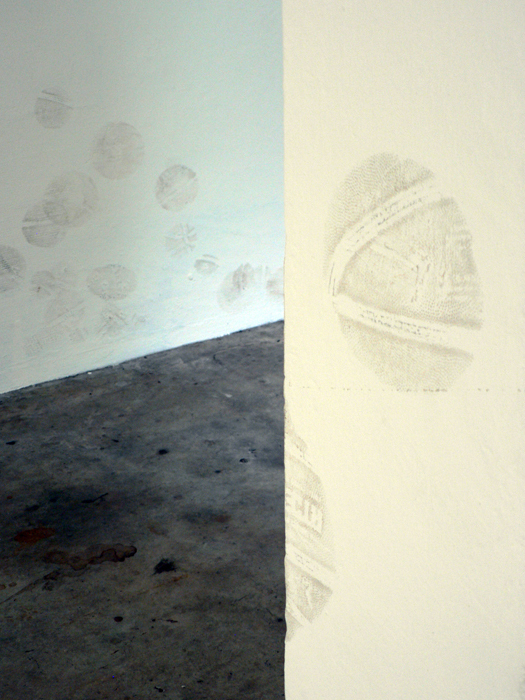 The blood stain took months of washing and rainfall to lighten; I avoided walking along that stretch of pavement for some years until we moved out of Clementi. Within the limited resources of public housing design, the lack of overt decorative statements belie the premium placed on sensible and attentive detailing. By recessing the floor beams and brick walls away from the vertical shear walls, a grid of vertical and horizontal ‘fins’ were created for sunshading and some degree of rain-screening. Inclined horizontal canopies shade and weather-proof the lobbies and landings. Usually unnoticed, subtle micro-detailing that made a difference include groove lines, or drips, on the underside of exposed horizontal projections providing an effective barrier against rainwater. As a child, I marvelled at the way the locally manufactured “Lea Hin” steel windows worked as an ingenious gadget. Window stays varied the positions of top and bottom panels as the weather dictated. When it rained, the bottom panel had to be closed, but the horizontally pivoted top panel could remain open, allowing for ventilation while throwing off rain water. Underfoot, the beautiful terrazzo floor with dark green marble chippings on white cement, complemented by hand-finished coved terrazzo skirting, provided cool respite on a hot and humid day. These were the design touches in an otherwise modest, even austere palette of interior finishes. The point block was literally and metaphorically the pinnacle of HDB living, where upgraders from slab-blocks with smaller flats would aspire to. Its distinctive compact form and height was a novelty in public housing block design, holding an unbroken record for more than two decades until the first 30-storey tower was built in Queenstown in mid-1990s. Through the 1980s and 90s the HDB point block became ubiquitous. These flats, along with the slab blocks, have become so much a part of the Singaporean environment that they seem to exist as an ‘invisible’ backdrop where daily life unfolds. The ubiquity and high degree of standardization in the early HDB building types and design has also been critiqued in academic writing and popular media as being bland, stifling, and – in portrayals like Twelve Storeys – even dysfunctional. Meanwhile, with increasing affluence, the desirability of the point block as middle class housing was long overtaken by HUDC flats and condominiums. In recent decades, as more housing estates undergo Interim and Main Upgrading programmes, the original simple forms of these blocks of flats have become increasingly obscured by cosmetic additions. For all that, it cannot be denied that HDB new towns are a unique housing phenomenon, realising a vision of the state in forging a new society during the nation-building years. Where social housing in most parts of the world have all but degenerated into crime-ridden and filthy vertical slums, Singapore public housing did not. Meanwhile, HDB towns by virtue of housing 90% of Singaporeans, have evolved to be our ‘vernacular’ landscape. It is inextricably a part of society and identity, embodying both strengths and weaknesses, for better or for worse. My family settled in a private terraced housing estate when I was 13. In the meantime, the precinct where I had stayed for nearly 10 years gradually matured – as testified by the trees that have grown six-storeys high. The three point blocks appear to have retained its popularity, still attracting young families. Air-conditioning condenser units suspended on the external walls now conspicuously subvert the weather-tailored design. Otherwise, save for the usual cosmetic ‘upgrading’ like an incongruous coat of paint over beautiful fair-face brick, homogeneous tiling to the lift lobby, and real improvements like lifts that stopped at every floor, I was relieved that my childhood home remained recognisable – a fact not to be taken for granted in Singapore. Soon, I’ll be moving again, this time to my own apartment in the latest, and tallest, incarnation of the HDB point block. The author would like to thank his wife Kar Lin for her company down memory lane during the revisit to his childhood home, her feedback on the draft, and photography. 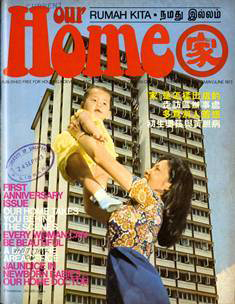 Thanks also to Dr Lai Chee Kien for alerting me to the cover image featuring a HDB Point Block in “Our Home” magazine. 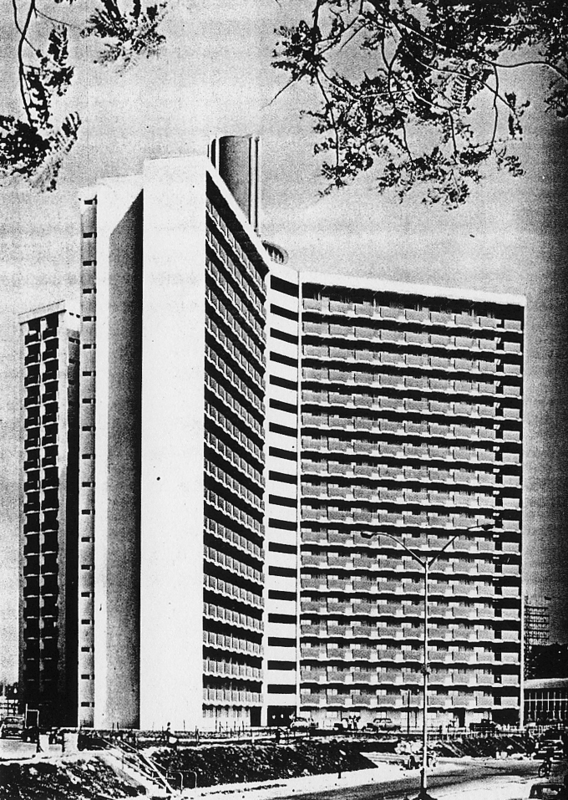 See 50,000 Units Up, Homes for the People – A Review of Public Housing by the Singapore Housing & Development Board, 1965. In many ways, this seminal self-account of HDB’s first 5-Year Building Programme reads like a political manifesto of the newly elected government. 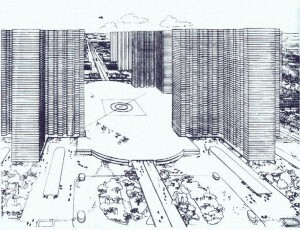 Liu, Thai Ker, “Design for Better Living Conditions” in Yeh, Stephen H.K. (ed), Public Housing in Singapore: A Multi-disciplinary Study, Singapore: Singapore University Press for Housing Development Board, 1975, p129. 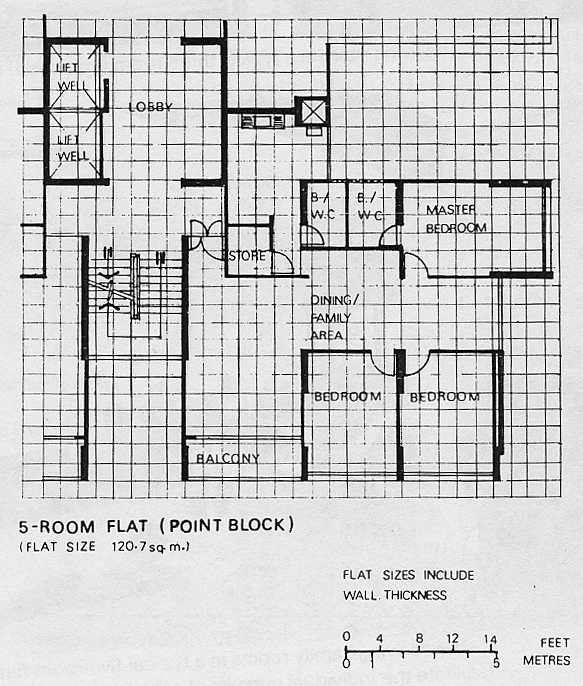 Wong, Aline K., and Yeh, Stephen H.K., “Physical Planning and Design” in Housing a Nation: 25 Years of Public Housing in Singapore, Singapore: Maruzen Asia, 1986, p71. 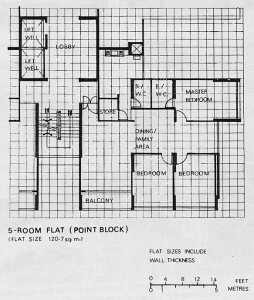 Housing Development Board, First Decades in Public Housing: Housing Development Board Singapore 1960-69, Singapore: Ministry for National Development and Law, 1970, p35. 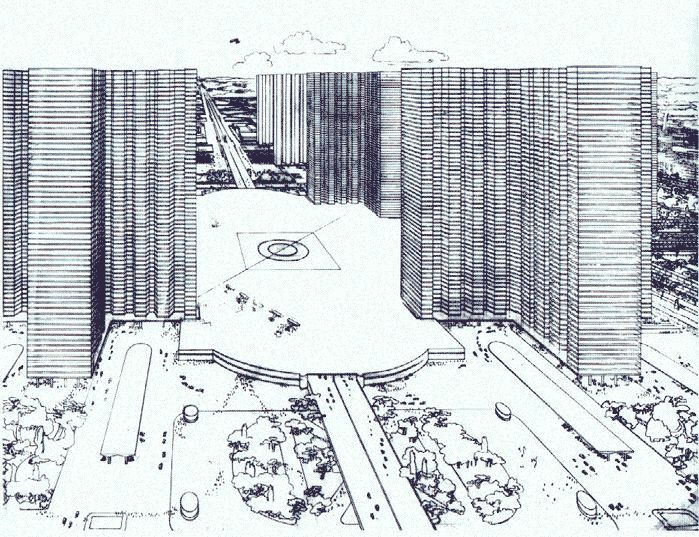 Wong, Aline K., and Yeh, Stephen H.K., “Physical Planning and Design” in Housing a Nation: 25 Years of Public Housing in Singapore, Singapore: Maruzen Asia for Housing Development Board, 1986, p107. Ho Weng Hin is an architectural restoration specialist and architectural historian, and received his postgraduate training in Genoa, Italy. Besides working on historic monuments in Singapore and Malaysia, he is currently co-authoring “Our Modern Past: Modern Architecture in Singapore 1920s-70s”, commissioned by Singapore Heritage Society and partially sponsored by the URA. Ho was former Editor of “Singapore Architect”, the bimonthly professional journal of the Singapore Institute of Architects. Perhaps it’s the idealistic foreigner in me, but HDB housing seems to be one of the great successes of the Singapore government. I’m also fascinated by some of the conditions and pricing involved with HDBs – such as a subsidy or cheaper price if you stay near your parents. Thank you for the article. One of my favaourite HDB building is Rochor Center. In my view, it is a clever mix of commercial and residential with beautiful space inside and outside. 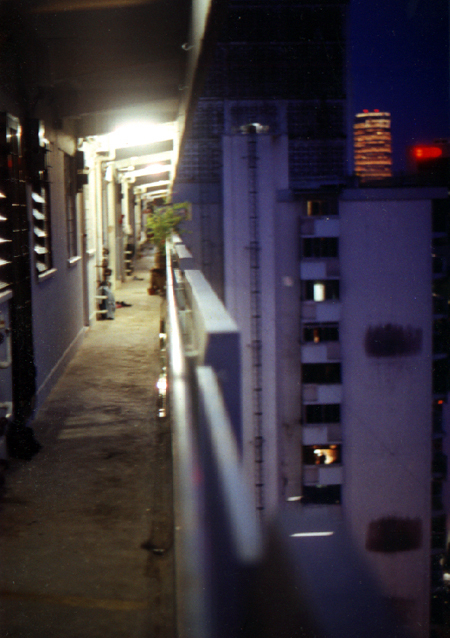 I am 17 this year, and have lived in an ‘old’ type of slab block HDB all my life – that is, until my family moved to the first DBSS point block type this year. Facilities and a beautiful home aside, it pains me that my neighbours – other than the kindly old lady opposite us – do not bother to even smile when taking the same lift. 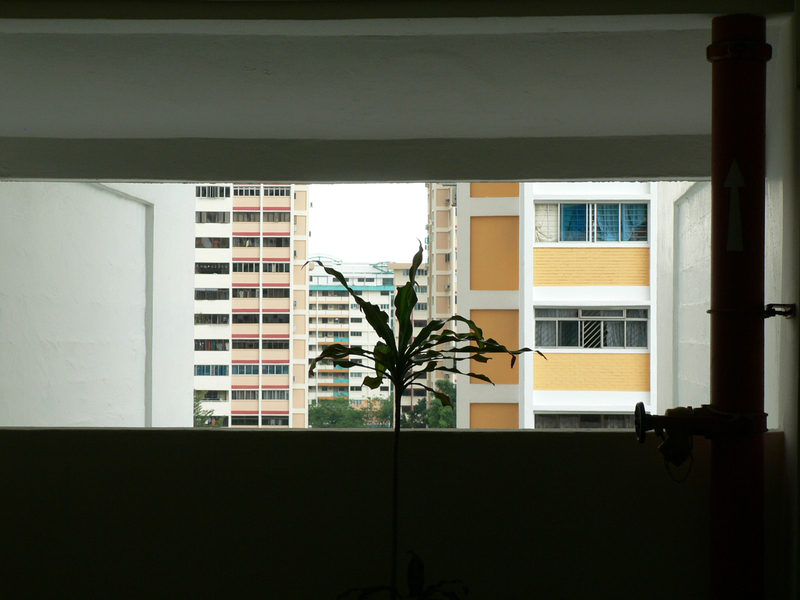 My old HDB estate was one big friendly clump of people, even if it was a little inconvenient and dirty sometimes – why is it that the cleaner and more modernized we are, the more unfriendly we become? hi, i’ll be very glad if you reply this, and even more glad if you know the answer to this: why was the design considerations made to have lifts in early HDB flats not stop at every floor? is it because it was expensive? or having it stop every floor make the average time lift usage increase? thank you!! In my own opinions, i think 5 room flat point block has the best layout floor plan regardless of wheather it is a 5 room standard or improved. The size of the flat has been fully utilised such that there is no waste area. The point block apartment has 3 facing including the main door. Even if those units’ dinning, master bedroom and kitchen with west facing, we still can depend on the main hall and front 2 bedrooms’s windows. 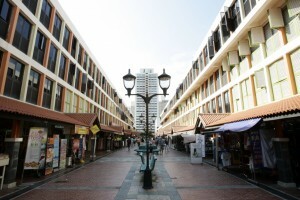 I hope to get this type of point block in Marsiling Drive/Lane when i am 35yrs or older especially those with seaview. tks for this article, brings me down memory lane as i used to play in my granny’s house, a 5 room point blk in amk when i was in primary school. i love it and thought it was big and prestigious that time ( i am in my mid 30s). Hi, the photo of the old playground, which area was that?